A ceiling boss in a medieval English building. 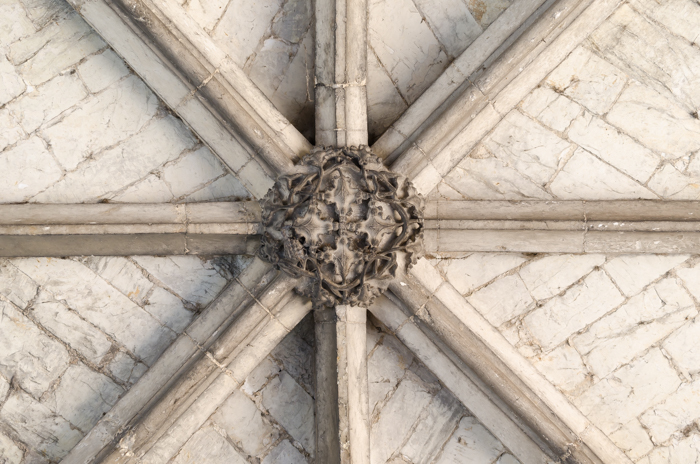 They are generally found at the intersections on rib vaults in Gothic architecture and are usually ornate. This one comprises leaf and stem patterns. Others common designs feature faces, animals and grotesques. This one is a remarkably delicate design, including actual filigree stonework, as well as the usual relief. My work as an architectural photographer takes me all over the three main counties I cover: Somerset, Dorset and Wiltshire. However, as a fan of architecture, I often have a camera with me wherever I go, and I like to take shots of anything interesting that catches the eye, and this is from a trip out of my usual operating zone, to Hampshire. It is in the Hospital of St Cross, in Winchester, which is an alms-house and is the oldest charitable institution in the UK. It dates back to 1132AD and is still in use, providing accommodation for 25 elderly men.